A compressor is used to compress superheated R-134a with an inlet 𝑇=25℃ and 𝑃=5.5 bars to a high-pressure tank with a mass flowrate of 0.02 kg∕s. The compressor power is 500 watts and the isentropic efficiency is assumed 0.85. Determine the temperature and pressure of the refrigerant at the compressor outlet. What is the temperature and pressure of the refrigerant at the compressor outlet for isentropic process? 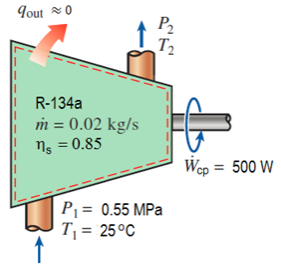 Refrigerant properties at compressor inlet 𝑇_1=25℃ and 𝑃_1=0.55 MPa. Mass flow rate 𝑚 ̇=0.02 kg/s. Compressor power 𝑊 ̇_cp=500 watts. Fluid properties table for R-134a (Table A-13, Cengel 2015). Refrigerant properties at compressor outlet, 𝑇_2 and 𝑃_2 for 𝜂_𝑠=0.85 and 𝜂_𝑠=1. We would use KOOLSIM™ software to obtain the enthalpy ℎ_1 and focus on the thermodynamic process in the compressor. 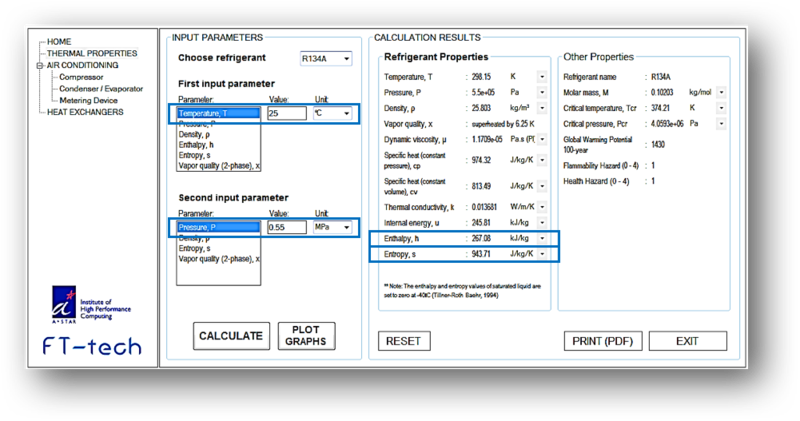 From Thermal Properties module of KOOLSIM™, we obtain ℎ_1=267.08 kJ∕kg for refrigerant R-134a at 𝑇=25℃ and 𝑃=0.55 MPa. As the refrigerant at compressor outlet is superheated, we need two known properties to obtain the others. Let us first look into the isentropic case, i.e. 𝑠_1=𝑠_2𝑠. Using KOOLSIM™, we can easily obtain 𝑠_1=𝑠_2𝑠=943.71 J∕(kg.K) by inputting 𝑇=25℃ and 𝑃=0.55 MPa. From P-h diagram above, it is clear that the temperature and pressure at the compressor outlet for 𝜂_𝑠=0.85 is the state evaluated at ℎ_2𝑠=288.33 kJ∕kg and 𝑠_2𝑠=943.71 J∕(kg.K) . KOOLSIM™ give 𝑷_𝟐=𝟏𝟒.𝟖𝟓𝟏 𝐛𝐚𝐫𝐬. Please note that other parameters cannot be evaluated using the values of ℎ_2𝑠 and 𝑠_2𝑠. Instead, 𝑃_2=14.851 bars and ℎ_2=292.08 kJ∕kg should be used, thus 𝑻_𝟐=𝟔𝟕.𝟎𝟖℃. Similarly, the temperature and pressure at the compressor outlet for isentropic process (𝜂_𝑠=1.0) can simply be obtained by evaluating the refrigerant state at ℎ_2=292.08 kJ∕kg and 𝑠_2𝑠=943.71 J∕(kg.K) , resulting 𝑻_𝟐𝒔=𝟕𝟐.𝟎𝟏℃ and 𝑷_𝟐𝒔=𝟏𝟕.𝟕𝟓𝟏 𝐛𝐚𝐫𝐬. The schematic and P-h diagram is given in the figure. If the compressor operates isentropically, the pressure at compressor outlet is higher than that of non-isentropic process, because all the input power will be converted into internal energy of the refrigerant. 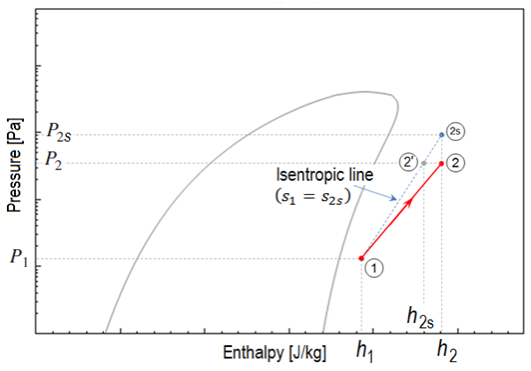 The outlet enthalpy for both isentropic (ℎ_2𝑠 ) and non-isentropic (ℎ_2 ) compression process, given ℎ_1, 𝑊 ̇_cp, 𝜂_𝑠, and 𝑚 ̇, can be calculated using the following equations. The only unknown variable for calculations of ℎ_2𝑠 and ℎ_2 is the enthalpy at the compressor inlet ℎ_1. 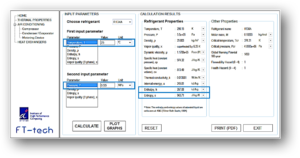 The value can simply be obtained from Refrigerant Properties Table using the given inlet temperature and pressure. However, multiple interpolations are necessary to obtain the value of ℎ_1 from the table for given 𝑇_1=25℃ and 𝑃_1=0.55 MPa, i.e.